A movie that is interesting only in that one of the characters is Marilyn Monroe and another is Lawrence Olivier, this film has little humor, and nearly no conflict, leading to a pretty dull experience. A movie filled with missed opportunities, this film should have been so much more. At the very least it could have been something like the King’s Speech (here, featuring a story about an actress who just couldn’t remember her lines,) or Hitchcock, (a movie about one actress on the set of a famous film.) Instead, we get a movie that avoids all things that worked for other films, and instead goes the cliche route every chance it can get. This means that neither Marilyn Monroe nor Sir Lawrence Olivier is a main character, and instead, we get a fish out of water story, about a man named Colin who spends one week working on the set with Marilyn. That would be fine if this was a particularly interesting or exciting week. Only it isn’t. The conflict is very limited. The acting is all fine, but the movie has very little to offer that we haven’t seen before. My Week With Marilyn seemed like the kind of movie that had real potential. 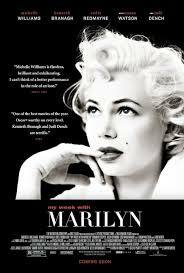 After all it was more than just the life story of Marilyn Monroe, and therefore the usual kind of biopic. This was about a single week spent with the actress, and nothing more. It’s the equivalent of a small moment story, capturing just a tiny bit of the characters life and looking at it in a box. There’s a lot of positive that can come from telling a story like that, with such a limited amount of time. One could assume that a movie like this would focus on only one or two major conflicts. Otherwise why choose that week to tell a story about? Why not choose a different week in her life that did have some major conflict worth making a movie about? Unfortunately this whole idea and assumption about the movie being built around some great conflict is wrong. That wasn’t the reason why this movie was made. It was made because a man named Colin spent a week on a movie set with Marilyn, getting to know her, and then wrote a book about it. The book was the inspiration for the movie. But the movie is not loaded up with conflict. In fact, it barely has any at all. And if there’s not much conflict, then the other assumption that could be made about this movie is that maybe it has a lot of humor. After all, this could easily be something like The Kings Speech, about Hollywood royalty and the problems that were getting in the way of a movie being made. In that movie, the king couldn’t speak without stuttering. In this film, the actress just can’t remember her lines. If more time was spent on this issue, it could have actually amounted to something. But even this problem is not brought out as a major plot point, the way that maybe it should have been. Instead of being dramatic, and loaded up with conflict, or being comedic and fast-moving, this movie never actually declares what kind of film it wants to be at all. It seems to just exist without any clear purpose. Now there needs to be a reason for making a movie and in the case of this film the reason doesn’t go past the idea of looking at some specific actors on the set of a specific movie, simply because an account of the situation exists. So why not make a movie out of it? Now, even the idea of showing us a behind the scenes look at the making of a film could work, as it did for the Anthony Hopkins movie, Hitchcock. But that movie focussed on the most interesting character. Hitchcock, the man, was front and center, in that film. Here, Marilyn is only a side character, with us getting an outsider’s perspective, and a protagonist who is an everyman and a fish out of water. Basically every cliche you can throw out there, is something this movie tries to utilize. That’s unfortunate, because a movie really needs to have something new to offer. With Hitchcock, it was about how the man was such a unique character, and about his finding the inspiration for all of those classic moments of the movie Psycho. If this Marilyn Monroe movie had been about her making the movie Some Like It Hot, or The Seven Year Itch, then maybe it would have worked. We would get the behind the scenes version of how the skirt blowing scene came to be, for example. But here, it is about being on the set of a movie that nobody even knows. What a wasted opportunity. Considering how many ways this movie could have gone right, and how many wrong turns it took instead, it’s a wonder that the movie isn’t awful. But it’s not. It’s just okay. The actors are likeable and they handle their roles well, bringing us in and making us want to care about them. The story is more about the young man, Colin, working on the set than it is about the actors he is working with. Mariyln Monroe (played by Michele Williams,) is hardly the star of the film. She is simply the character that Colin becomes infatuated with. And you can definitely see why, with the kind of attention she shows him and ways that she makes him feel. By telling us the story of the young man, starting with his family and tracing the path of his ambition and persistence, we end up spending only a limited time with Monroe and Sir Lawrence Olivier. Now that’s a problem, because these are the characters we really want to see most. The movie approaches them with the strategy that if they are given limited screen time, then they will be the very interesting supporting players that we always want more of. Only what that really means is that we spend most of the movie alongside this character Colin, who nobody really cares about. 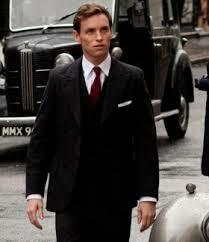 Luckily, the character is played by Eddie Redmayne, who is a terrific actor. I’ve now seen Redmayne in a number of movies (The Theory of Everything, Les Mis,) and in each of these examples, his performance was good, but the movie was not. At the start of the film, we hear Colin’s voice-over as we see him roaming about his families mansion, dealing with his parents. Colin feels that he cannot live up to his father’s expectations, or compete with his older brother, on any level. And so Colin realizes he has to get out of there, away from his family, and to prove to them that he can make it on his own. And so he goes to London to seek employment on the set of a new Lawrence Olivier film. The problem comes when Colin shows up at the office and learns that there is no job and at the moment. In fact, there is not even a film. He sits on the couch in the lobby of the office, showing up every morning, waiting for a job. It’s humorous, (one of the only funny moments in the film,) but also a little psychotic. We laugh at it because the movie presents this part with quick cuts, fast music, and a lively kind of energy. But the truth is this guy would have gotten the boot, and not been allowed to just make the couch his personal area of occupancy. Still, for the purpose of the movie, it works. When the secretary needs to go out one day and asks Colin to watch the phone, he gets an opportunity to prove himself, finding a phone number for the man in charge of the office, that is apparently unlisted and very difficult to get. Despite proving himself there, Colin still is not given any kind of a real job. That doesn’t happen until Lawrence Olivier himself, (played by Kenneth Branagh,) walks in one day and his wife (played by Julie Ormond,) reminds Olivier that he once told Colin to show up at the office for a job. Now what is this? We haven’t heard anything about that past moment, and the movie would have been far better served if Colin had done something here to impress Oliver or his wife. Instead, telling us about a past run-in and promise is really not giving us a whole lot. The famous manta, “show, don’t tell,” is definitely not being used here. The same goes for that moment with the hard to get phone number that Colin somehow found. We never see how he found it. The movie cuts from the man in charge telling Colin to find it and that it will be difficult, to Colin presenting the man with the number. In these moments, the movie definitely seems like it is trying to cut corners and not giving us the moments that could really make the scenes stick out as memorable or interesting or both. Eventually, we do meet Marilyn. She seems nice and charming, but the problem is she can’t remember any of her lines. This makes Olivier, (who is not only acting beside her, but also directing the film,) quite enraged. Marilyn has her own way of doing things, and that sometimes includes being so nervous that she just walks off the set. At other times she says the reason why she can’t remember her lines is because she doesn’t believe them or doesn’t feel they are right for the character. Or she says she doesn’t know the character well enough yet. Basically she comes up with a whole bunch of excuses, and luckily an actress named Dame, (played by Judi Dench,) comes to Marilyn’s aid, supporting her, and calling Olivier a bully. I said at the start of the review that there was very little conflict in this movie. Well, this is it. Marilyn can’t remember her lines. That’s the conflict. Colin goes over to Marilyn’s place to check in on her one day, and suddenly the two of them start getting close. They go for a walk together, and then another day she has her driver pull up to the set and ask Colin to get in the car. When he does, he finds out that Marilyn is in there too, and the two of them are whisked off to an all day get away in the country-side. At one point, we hear through conversations with producers on the set that all of this has gotten back to Marilyn’s husband, Arthur Miller, and that he is upset. But we never see any of it. Once again, this is telling instead of showing. A scene where Miller showed up and confronted Colin would have been fantastic. Now that could have been a real climax. This movie just doesn’t know how to handle conflict. All of the building blocks were there, but we end up getting is a long list of missed opportunities and examples of what could have been.